I was forced to walk through a Thailand food market that was in front of the Panthip Computer store in Rangsit, Thailand yesterday. 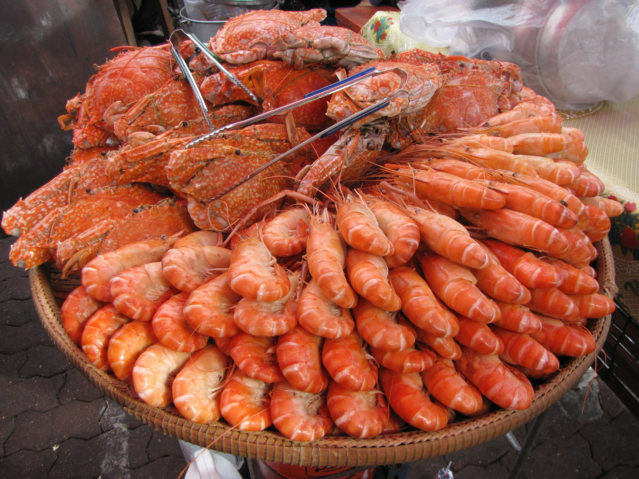 Shrimp, Crabs and fuzzy fruit, it is always a colorful day when walking through the food markets in Thailand; you never know why the market is located where it is located, it is just there. Intriguing, however the smell can sometimes be annoying, as the smells are all in the same soup. I truly love Shrimp Cocktail; however, I can never buy the cocktail sauce or the horseradish to make my own, and it just does not taste the same. 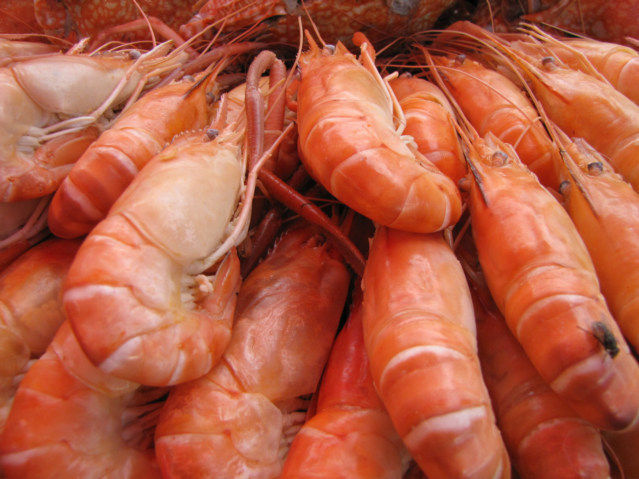 Large Thailand Shrimp, I suspect they are raised in the Shrimp farms close to the ocean here; I doubt it is natural Shrimp. 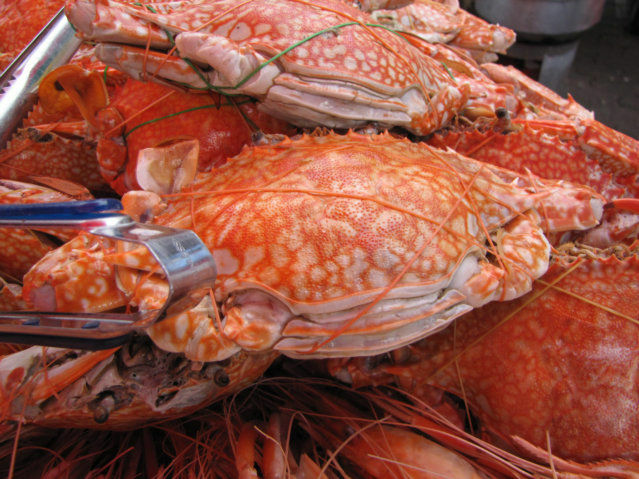 Crabs, I have never seen a crab farm, I do not know if they grow them in farms or not? 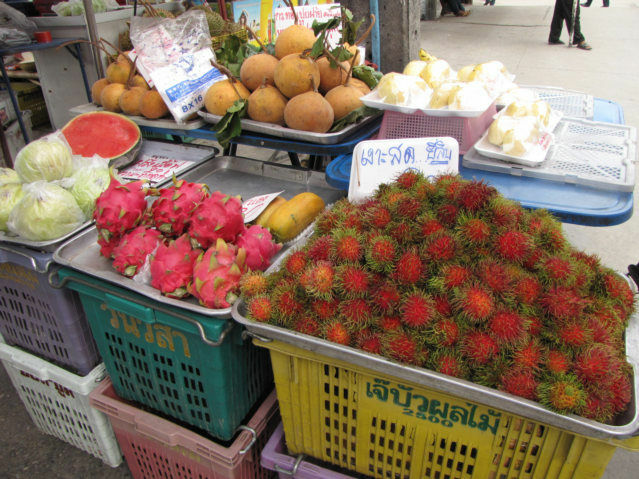 There are many types of strange vegetables and fruits for sale in Thailand, I always think the fuzzy ones are interesting. I was nervous calling it a fruit, I never know, maybe it is a vegetable. Damn I am a great internet Travel Writer. I set the stage, I engaged the audience, and I proposed in a way that that elicited all the answers I needed to satisfy my curiosity. A writers job is not to think for you, a writers job is to make you think and feel. The tools of an internet writer are different than a magazine writer. Send a donation on a topic. I will focus on answers.